If you are looking for some distance gains with the driver, you may want to consider a trip to Colorado instead of forking over $500 for the latest and greatest. With the entire state resting at least 1000 meters above sea level, you will gain at least half a club, no questions asked. This was my first golf visit to the "Centennial State" and Colorado has some serious golf options located just outside of Denver. First up on the agenda was Jack Nicklaus' Castle Pines. The course opened in 1981 and from 1986 to 2006 hosted the International, a PGA Tour event. In certain circles, Castle Pines may be even more well known for it's milkshakes. I finally would know the feeling John Travolta expresses in the clip below from Pulp Fiction. They are seriously that good. After a glorious introduction to golf in Colorado at Castle Pines, a day of 36 at Cherry Hills and Colorado Golf Club was on the calendar. It's quite possible that Travolta prepared for his role as Vincent Vega by visiting the Castle Pines shake shack. Click on any of the images to view all of my photos from that course. Cherry Hills is most well know for the 1960 US Open in which Arnold Palmer erased a 7 shot deficit to claim victory. Being a part of Arnie's Army for as long as I can remember, I couldn't have been more excited for my visit. If there was a single swing that earned Arnie the tile of "The King" his drive on the first hole at Cherry Hills was it. Palmer would find the green with a persimmon driver and balata ball on the 346 yard par 4. Would I be able to drive the green and duplicate the feat? Would I birdie 6 of the first 7 to shoot 65? Could I live up to the legend? The answer would be a resounding no. Even with superior technology, I would come up 30 yards short on #1 and only manage two birdies in the first seven holes. I was pretty stoked about those 2 birdies with one coming on a holed out bunker shot. A view from Arnie's tee box on #1 at Cherry Hills. After a fantastic morning round at Cherry Hills, I headed down the road to Colorado Golf Club. CGC was created by the architectural duo of Coore & Crenshaw. Having enjoyed several of their creations, I was excited for the afternoon round. Adding some more flames to the fire was Instagram sensation Karin Hart. Karin is a newcomer to the game, but she has picked things up nicely. The short 2nd hole kicks off the par 3 fun at Colorado Golf Club. Aside from the course, one of the highlights from our round at Colorado Golf Club was our forecaddie, Sadie LeCheminant. Usually, I struggle to find serious value in a forecaddie, but Sadie brought the heat to our foursome. A former professional snow boarder, Sadie was easily the best forecaddie I had experienced. Book her today if you are serious about having a well informed and joyous time on the golf course. Sadie dials in the yardage, she would later dial in a well timed golf quip. Next up was the 3 hour drive to Holyoke, CO and Ballyneal Golf Club. With a population of 2,313 people, you probably have not heard of Holyoke. However, Ballyneal is doing a great job of putting Holyoke on the map. Even though it's in the middle of nowhere, Ballyneal has a small cozy resort feel to it. Everything a golfer could want is right on the property. With a large putting green course, a par 3 course, and a championship layout, you won't run out of golf to enjoy. Left to myself, I would play until darkness covered the course, then I would play 3 more holes. The wildly fun 6th hole is a drive-able par 4 with a uniquely shaped green. After a drive back to civilization, I would find myself in Colorado Springs looking at The Broadmoor Hotel. 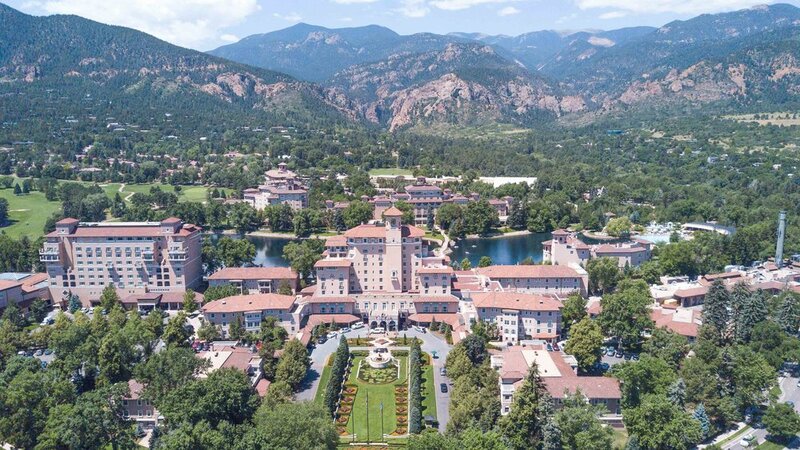 The Broadmoor is a member of the Historic Hotels of America and it's visitors have included heads of state, celebrities, athletes, and business tycoons. In 1986, George Bush woke up with a hangover in the Broadmoor and decided "he would drink no more." The Broadmoor parties hard. There are also 3 golf courses at The Broadmoor and I was scheduled to take on the East Course. The East course was designed by Robert Trent Jones Sr and Donald Ross. The course has hosted a number of USGA events over the years and will host the 2018 US Senior Open. In an attempt to save up some golf karma, I would go birdie free during my round at The Broadmoor. However, I would score with my pairing and join up with two fantastic gentlemen. After the round, we would tour the hotel. It's worth a visit even if you are not staying on the property. Originally established in 1918, The Broadmoor Hotel has 779 rooms. For the final leg of my Colorado tour, I would take in a recommended local course called Bear Dance. Despite it's name, the course was not designed by Jack Nicklaus and I would not dance with any bears. However, I would resume my dances with birdies and get my fist pump on 4 times. In a very anti climatic end to the trip, I would par the final hole of the trip and stop at a Taco Bell on my way out of town. I usually prefer the birdie and Arby's exit strategy. The astoundingly large bear paw bunker at Bear Dance was not actually left by a 15,000 pound bear.